A mining program is injected to QTS using your NAS to work for mineXMR.com. My TS-119P II which has a Marvell 88F6282 is running QTS 4.3.3 but doesn’t have this issue. According to the [Connection Details] section in [Get Started] tab on mineXMR.com, port 4444 is for Low end CPU. And also the [Mining Apps] section, this program should be CPUMiner (forked by LucasJones & Wolf) which is available on GitHub: OhGodAPet/cpuminer-multi. In the README.md file, it’s described as an x86-64 only program. CryptoNight works only on x86 and x86-64. If you don’t have AES-NI, it’s slower. A lot slower, around 1/3rd the speed. This implementation is deprecated and will not be improved. If you are using a NAS with ARM architecture, you have less chance to get involved in this issue. On 2017/5/13, netgear54 shared his hacking forensic investigation on disk_manage.cgi hogging CPU usage. It’s a command injection through Photo Station. Read the detail in Security Vulnerability Addressed in Photo Station 5.4.1 and 5.2.7. This attack differs from Code Injection, in that code injection allows the attacker to add his own code that is then executed by the application. In Code Injection, the attacker extends the default functionality of the application without the necessity of executing system commands. See if you have high CPU utilization, any strange process from /mnt/HDA_ROOT/, and any unknown schedule tasks on /mnt/HDA_ROOT/. Let me explain the commands you need and show you some examples. You probably will see high CPU utilization (30% or higher) in [Control Panel] → [System Settings] → [System Status] → [Resource Monitor] → [CPU usage] tab when low network access. But if your are using QTS 4.3.3, don’t get fooled with the [Resource Monitor] gadget in [Dashboard] which may be launched by upper right corner. It’s not always updated automatically. Enable Allow SSH connection in [Control Panel] → [Network Services] → [Telnet/SSH] tab, ssh as admin and search for process disk_manage.cgi. If /mnt/HDA_ROOT/disk_manage.cgi is found, you probably get infected. Check schedule tasks in next section. disk_manage.cgi is a standard QTS program but /mnt/HDA_ROOT/disk_manage.cgi isn’t. It’s a fake with the same name to fool you. ps is used to check for current processes. 26472 is the PID (Process ID) of /mnt/HDA_ROOT/disk_manage.cgi in this case. You may learn more detail in PROCESS STATE CODES section in Man Pages PS(1) and a great post on ps aux output meaning on superuser. Here is a list to help you understand the symbols used by ps. Z: Defunct (“zombie”) process, terminated but not reaped by its parent. You may also use [Control Panel] → [System Settings] → [System Status] → [Resource Monitor] → [Process] tab to find /mnt/HDA_ROOT/disk_manage.cgi. Because it only shows top 15 processes, I don’t recommend this method. Enable Allow SSH connection in [Control Panel] → [Network Services] → [Telnet/SSH] tab, ssh login to QTS as admin and search for schedule task rcu_shed. If /mnt/HDA_ROOT/rcu_shed is found, you probably get infected. Because we know how it hacks, the first step is to upgrade to the latest Photo Station 5.4.1 (for QTS 4.3.x) and 5.2.7 (for QTS 4.2.x). Use App Center to update current version or download the latest from Photo Station page. Although it focus on x86-64 systems, I suggest everybody to upgrade even you have an ARM model. Next command injection may go through Photo Station again if you choose to stick with existing version. JarnoVanDerLinden found there is no autorun.sh and suspect an exploit related to Security Vulnerabilities Addressed in QTS 4.2.3 Builds 20170121 and 20170124 in his post on this thread. Therefore, even you have kill the process and remove the schedule task, it might happen again until you install the security patch. Before we confirm the exploit and security patch, please remove the malware manually and monitor your NAS regularly. I didn’t know the PID of your processes and it is different from time to time. Therefore, please use ps to check by yourself. It’s the number on the first column. Remember, there are at least 3 different processes. You might see more PID than 3 if it is running. Kill them all. To stop reload the mining program, remove following line in your cron configuration file. Use vi to load /mnt/HDA_ROOT/.config/crontab, delete following line, and overwrite existing file. Some report crontab -e doesn’t work to remove this line which I cannot confirm and have no ideas why. /mnt/HDA_ROOT/qwatchdogd is also a fake program. It’s not the build-in /sbin/qwatchdogd. There is a [Malware Remover] in [App Center] in your QTS but not available on QNAP App Center page yet. The latest version 2.1.0 may remove this mining program and related files completely. It will be execute every restart or turn on automatically. You may also download from here which is a direct link to QNAP. You need to unzip the download file and upload the QDK_2.2.14.qpkg in [App Center] in QTS. [App Center] may be launch in [Main Menu] on upper left corner. [Malware Remover] can be found in [Utilities] category or just search for “malware”. Information    2017/05/04    09:50:54    System    127.0.0.1    localhost    [App Center] Malware Remover enabled. Information    2017/05/04    09:50:54    System    127.0.0.1    localhost    [App Center] Malware Remover 2.1.0 has been installed in /share/CACHEDEV1_DATA/.qpkg/MalwareRemover successfully. More about this program can be found in Detail Explain of QNAP Malware Remover 2.1.0. This program is also available in Security Advisory for XMR Mining Program. History release notes may be found on Malware Remover. In [求救] QNAP 中咗malware on HKEPC , TS-269H users reports high CPU utilization after installing/upgrading to the latest Malware Remover 2.1.2. Because of this, everything becomes extremely slow. Get Malware Removal 2.1.1 on QNAP. Open the URL to your TS-269H. You probably won’t be able to see it due to busy CPU. Use power button on TS-269H to turn off. Press power to turn on. Stay close with the URL or reload until you see the login page. Launch App Center to remove Malware Remover 2.1.2 ASAP. Reboot your TS-269H again immediately. Login and install Malware Removal 2.1.1 in App Center. By the time you read this section, QNAP should restore 2.1.1 for TS-269H. You probably won’t see 2.1.2 in your App Center. 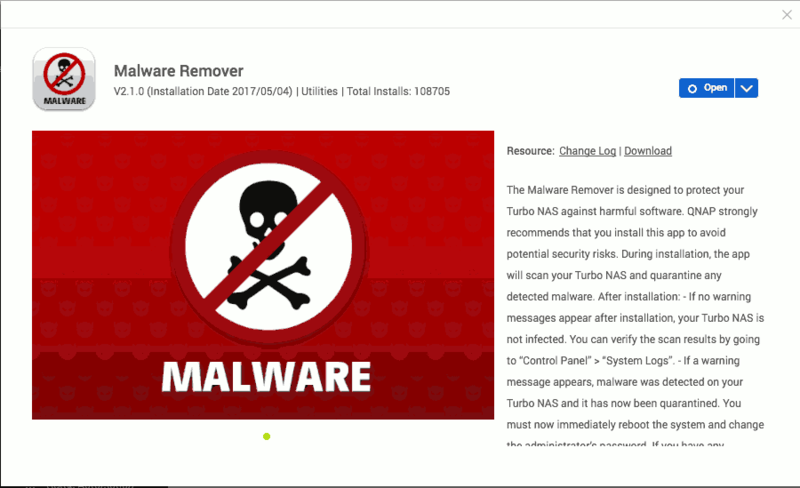 It has been reported by tcbyxx in #69 of this post that Malware Removal 2.1.3 is available to download which is not available in release note of Malware Remover yet. It has been tested by stevencheuk that everything goes back normal. Therefore, you may try to install Malware Removal 2.1.3 in step 7 or 9. Although this attack use a command injection through Photo Station, it’s a good idea to check the latest security patch ASAP especially Security Vulnerabilities Addressed in QTS 4.2.3 Builds 20170121 and 20170124 and Security Vulnerabilities Addressed in QTS 4.2.4 Build 20170313. It’s not necessary to upgrade your firmware to 4.3.3 if yours is 4.2.x. Just apply the patch. It is recommended to follow the instruction on An Urgent Fix on the Reported Infection of a Variant of GNU Bash Environment Variable Command Injection Vulnerability on QNAP by reinitialize NAS. They might also install other backdoors for future visit. Please read Synology Security Issue and How-to Harden your NAS if you want to know how to secure your NAS. Have been disabled in disable_functions in php.ini. Have been installed Suhosin which is a PHP security extension. To check disabled functions in your NAS, run phpinfo() or get them from phpinfo() Reports on NAS. Then search for disable_functions section. To stop exec() and shell_exec(), just add it to disable_functions in php.ini as below. QTS‘s php.ini on can be found in /mnt/HDA_ROOT/.config/php.ini and /etc/config/php.ini according to QNAP QTS Configuration and Executable Files. To stop eval(), you cannot use disable_functions because it is a language construct. eval() is not a function. You need Suhosin and check Suhosin HOWTOs: eval() and other language constructs for detail. I recommend to read PHP: How To Disable Dangerous Functions on StackOverflow for more discussion and Suhosin on wiki to understand what it can harden your php. Thanks for posting this…..after installing pfsense I noticed a absolute bombardment of blocked packets to Ukraine. Trolling the web has led me here. While I must have a different variant, the remedy was the same.